Knurling Inserts are made from Free Machining, Free Cutting, Leaded Brass, 300 Series Stainless Steel or Aluminium which are Passivated and Tested to ASTM Standard. Knurling Inserts are available in any metric or imperial sizes as per custom specification. Knurling Inserts with strong and reusable threads. Straight knurling at the top end of the insert offers higher torsional resistance. Slotted Knurling insert compresses allowing easy access into the mounting hole. Feature Knurl/Groove patterns designed for optimum torque and pull out resistance. Custom Range of Knurling Inserts provide a large bearing surface and ideal for fastening. No Heat or Ultrasonics Required. Knurling Inserts provide better grip in plastic molding. Knurling Inserts are easy to Install. Knurling Inserts compress slightly along their machined-in Slots; as a fastener is threaded in. The knurl of the Insert presses into the wall of the hole, securing the insert in place. Knurling Inserts meet RoHS Requirement and UL Listed. Knurling Inserts provide strong threads and fastening support for materials. Wide range of Knurling Inserts create a threaded hole in applications that only allow access from one side. Standard Knurling Inserts used where a strong metal thread is required in Plastic Material. 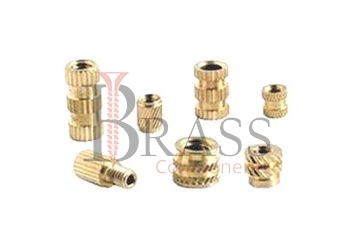 Ideal for electrical connections and for additional pull out resistance in reverse installation. Knurling Inserts are generally designed for use with both thermoset plastics and thermoplastics. All dimensions in mm.Pilot hole dimensions are for reference purposes only.